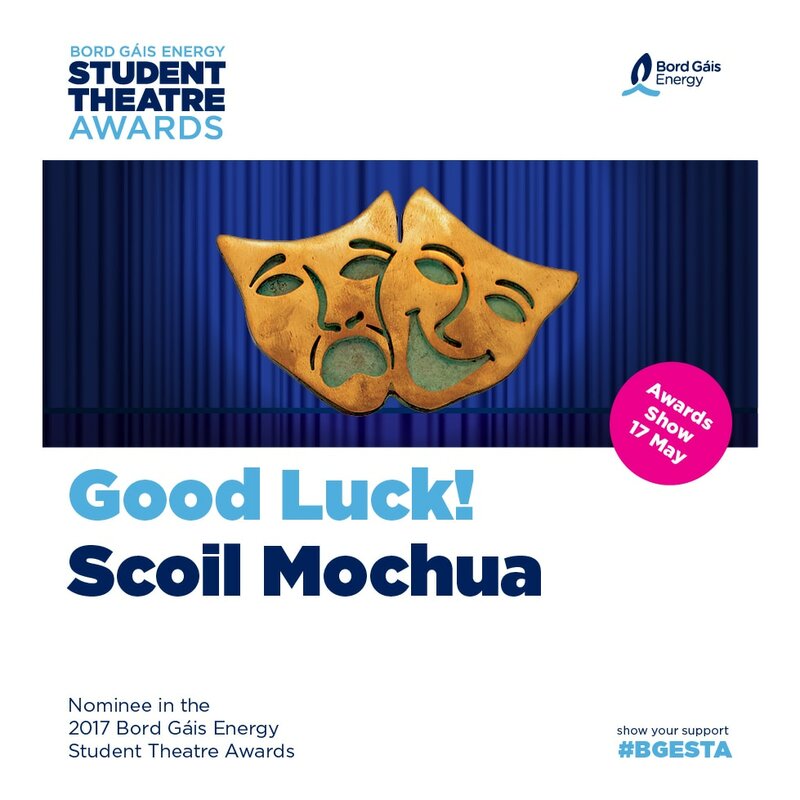 We are delighted to announce that Scoil Mochua won the award for Best Choreography in this year's Bord Gáis Energy Student Theatre Awards. The awards show was held on Wednesday, 17th May in the Bord Gáis Theatre and Scoil Mochua's performance of Hard Knock Life helped to kick off an absolutely incredible show. We are so proud of the children for their dedication, hard work and fantastic attitude throughout. ​This is an experience we hope they will never forget. In May of 2016, Scoil Mochua staged a wonderful production of the musical Annie Jr. Children from 4th, 5th and 6th classes took part. The show got rave reviews from across the school community and now it has also been recognised on a national level. Best Overall Musical and Best Choreography! We are absolutely thrilled and are so proud of all the children involved! A prestigious "Oscar-Style" awards ceremony will take place on May 17th in the Bord Gáis Energy Theatre. This will be hosted by 2FM DJ Eoghan McDermot. This year’s judging panel comprised of actress Amy Huberman; Dancing with the Stars Aoibhín Garrihy; best-selling novelist Sinéad Moriarty; writer and storyteller Dave Rudden; theatre designer Monica Frawley; manager of the Bord Gáis Energy Theatre Stephen Faloon; and Bord Gáis Energy Sponsorship Programme Manager Tanya Townsend. Commenting on the shortlist Irene Gowing from Bord Gáis Energy said: “Year on year the standard of entries blows us away, and this year has been no different! Entries across all categories have been so impressive meaning this year’s judges have had a very difficult task trying to narrow down our shortlist. Click the link below for more information and to see the full list of shortlisted schools! ​As well as this, three children were invited to sing on The Today Show with Maura and Dáithí on RTE. This aired on Tuesday 11th April and can be viewed on the RTE Player by clicking the link below. ​The segment begins approximately 20 mins in. ​​Based on the popular comic strip and adapted from the Tony Award-winning Best Musical, Annie JR. features everyone’s favourite little redhead in her very first adventure. With equal measures of pluck and positivity, little orphan Annie charms everyone's hearts despite a next-to-nothing start in 1930s New York City. Annie is determined to find the parents who abandoned her years ago on the doorstep of an orphanage run by the cruel Miss Hannigan. ​Annie eventually foils Miss Hannigan's evil machinations, finding a new home and family in billionaire Oliver Warbucks, his personal secretary, Grace Farrell, and a lovable mutt named Sandy. We have a fantastic cast of over 40 children from 4th, 5th and 6th class who are going to entertain you in this cheeky, fun-filled, family-friendly show. For further information please contact Ms. Corr or Ms. Smith and watch this space for more news and exciting announcements.